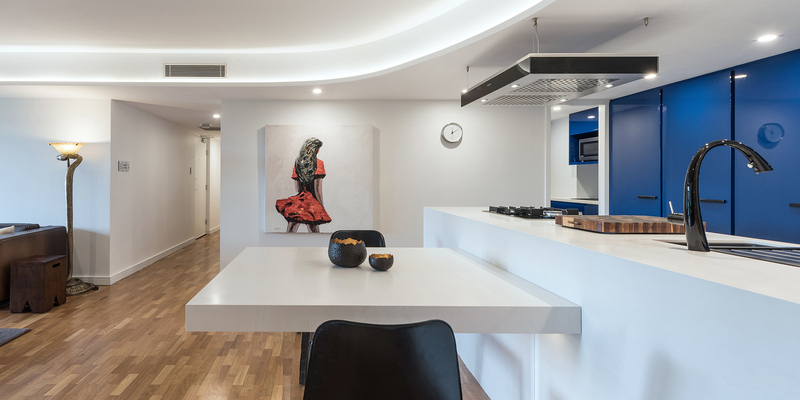 Kitchens By Design | Kitchen Design for Discerning Clients : Sydney. 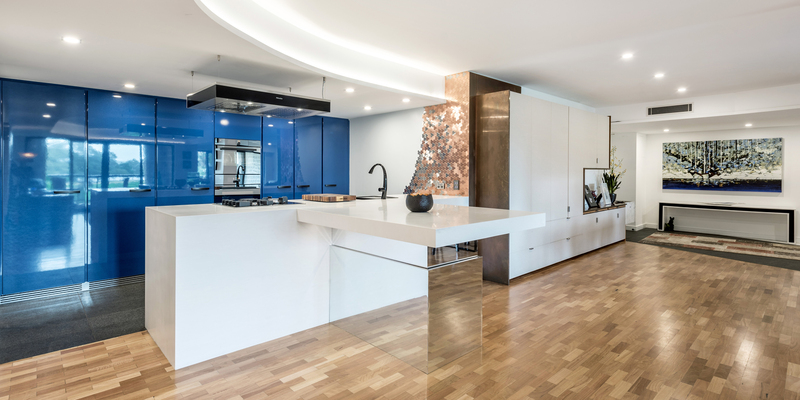 This stylish and modern kitchen was designed for a small family living in a large city-centre apartment overlooking a park. 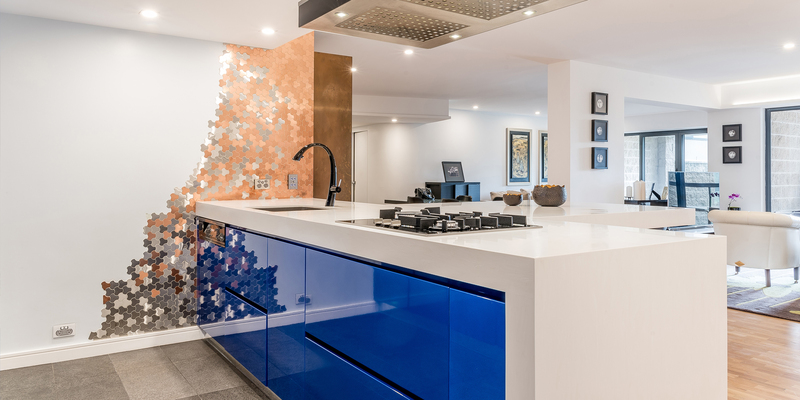 The brief here was to create a stunning, modern kitchen, and the designer did not disappoint. 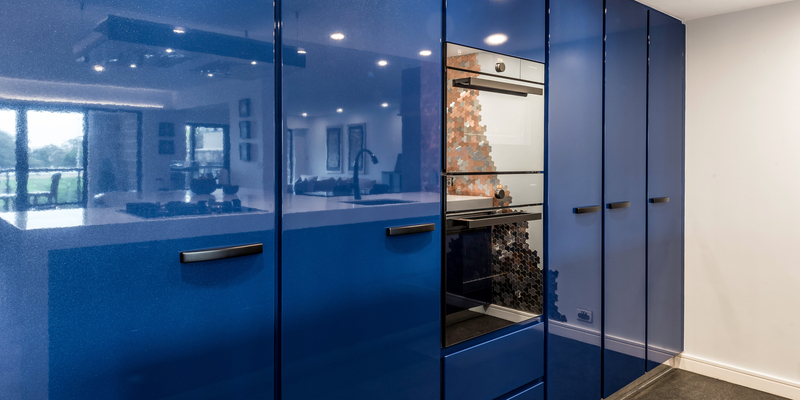 The bold colour inspiration came from a painting the client has hanging in the hallway, and this was translated into a high-gloss metallic finish on the cabinetry on back wall of the kitchen and the under-bench cabinetry on the peninsula. 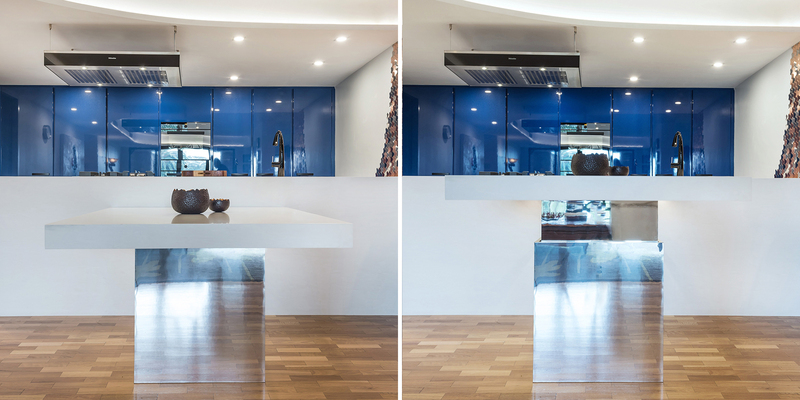 The facing of the peninsula is clad in mitred Corian Cirrus White, giving a stark contrast to the cobalt blue of the cabinetry behind. From the centre of the peninsula protrudes a built-in table (made from Corian) whose height can be adjusted, depending on its intended use. 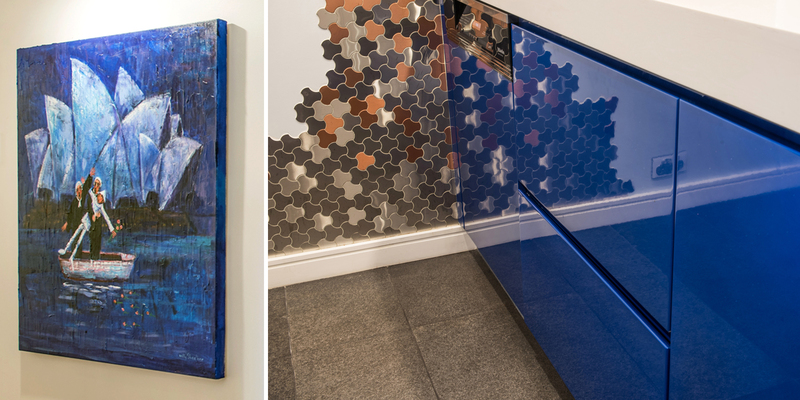 A mirror finish on the central plinth lifting mechanism makes the table appear to float, adding a little magic to the whole design. 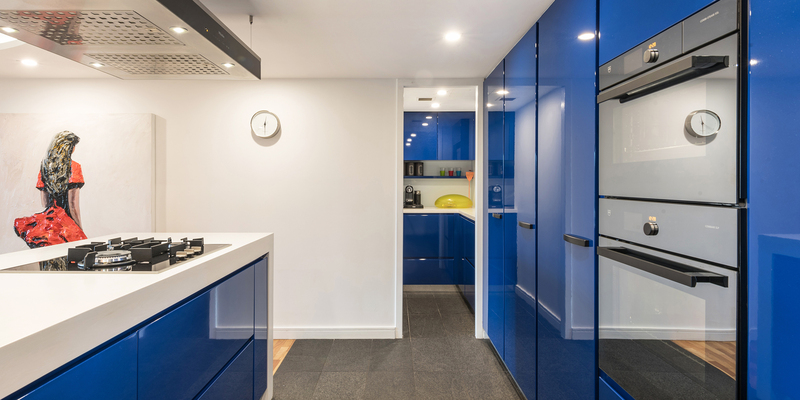 An adjacent walk-in pantry is small, but very functional, and contains a sink, dishwasher, hot water tap and microwave. 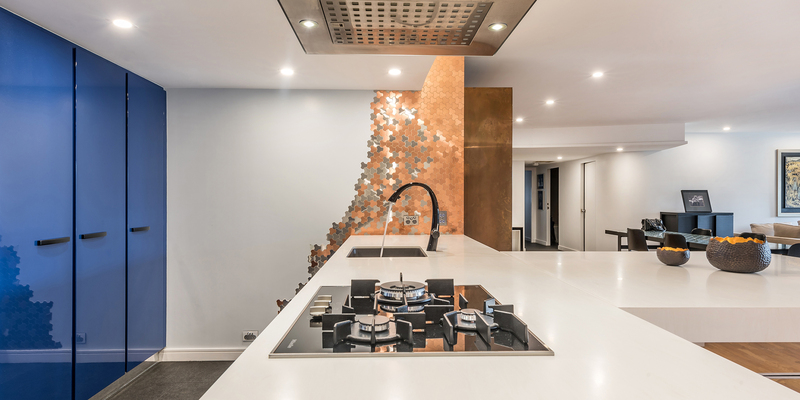 All interior walls are finished in white, apart from a swathe of hexagonal copper and stainless steel tiles that help the kitchen blend into the existing copper panelling in the living area. 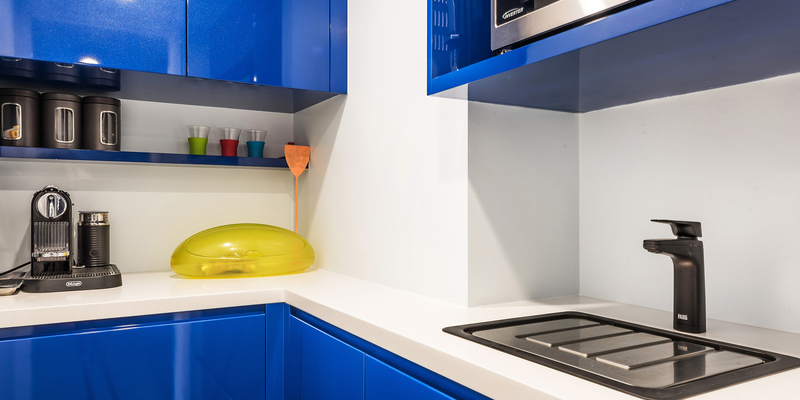 The bold colour inspiration came from a painting the client has hanging in the hallway, and this was translated into the cabinetry within the kitchen.